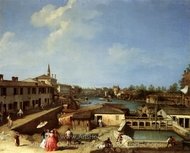 In 2005, a Canaletto painting entitled Bucintoro at the Molo on Ascension Day, sold at a Christie's auction in London for more than 11 million British Pounds or just over $20 million U.S. Dollars. In that same month, Sothebys recorded a record sale of 18.6 million British Pounds or roughly $32 million U.S. Dollars for Grand Canal Looking Northeast from the Palazzo Balbi to the Rialto Bridge. Giovanni Antonio Canal was born in October of 1697 in Venice, Italy. He was the son of Bernardo Canal and Artemisia Barbieri. As a young man, he worked as an apprentice to his father, designing and painting theatrical scenery. 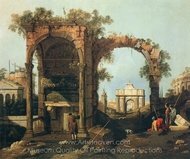 On a trip to Rome he became intrigued by the highly accomplished Roman artist Giovanni Paolo Pannini, who was a skilled Vedutista or view painter. Upon his return to Venice in the year 1719, Canal turned away from theatrical painting and applied his artistic skills to drawing and painting realistic depictions of the land, architecture and natural outdoor images in and around Venice. 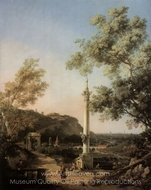 His views of Venice began to attract the attention of art collectors over the next several years and he created his first signed and dated work called Architectural Capricio in 1723 for a private art collector in Milan. It was shortly after that first work of art that the young Giovanni Antonio Canal started signing all of his work under the name of Canaletto, which, in Italian, translates into the little Canal. Canaletto not only sold oil paintings to Italian art lovers, but he also developed a strong following from Englishmen who would tour Italy in search of fine art. Joseph Smith, a well-to-do merchant from England, was one of the first to recognize the quality of Canaletto paintings and became a patron and an agent of the artist. 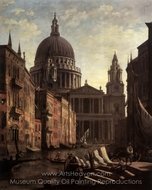 He helped bring interest in the works of the Venetian painter to the attention of London and was influential in creating more widespread notoriety for Canaletto. In the early 18th century, long before the invention of cameras and photographs, artists who painted detailed landscapes, with views of the city and everyday life, made it possible for people to see distant cities without having to actually travel to those cities. Visitors to Venice, who were also patrons of the arts, sought to acquire the depictions in oil of the canals and buildings of such an important, unique and historical city. 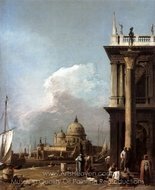 It was a real honor and accomplishment to own one or more Canaletto paintings. Prized possessions for collectors of the artist considered to be the best veduto painter of his time, today, Canaletto famous paintings hang in the most important museums around the world. 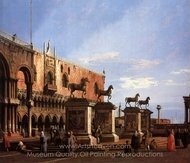 Canaletto famous paintings can be worth millions if they were put up for sale. In 1746, Canaletto moved from his native Italy to London, where his followers were anxious to commission new works. He painted views of London, including castles, bridges and other scenery. While the work was of the same nature as he had created in Venice, it lacked the same appeal and fine quality of his earlier works. By 1755, with interest in his portrayals of London starting to wane, Canaletto returned home to Venice. 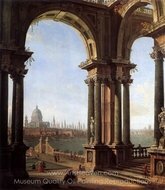 Canaletto continued to paint and in 1763 he was elected to the prestigious Venetian Academy. Giovani Antonio Canal died five years later in 1768, leaving behind a legacy of art that represents an important part of the Baroque paintings period in art history. Canaletto produced hundreds of famous paintings during his almost 50 years as a vedutista. Three of his most acclaimed works are listed below. While never attaining the status of a Michelangelo or Rembrandt, Canaletto paintings are highly sought after by museums and private collectors all around the world. Canaletto's realistic views of the canals of Venice, the architure of the city and his later work in England, put him at the top of the list for artists of his genre.